As you may know, Mrs. WooPigFoodie is a vegetarian. At the holidays each year, I buy her a cookbook or two that looks like it might have good vegetarian recipes, and have her pick a bunch of recipes for me to make for her. (True love.) This year, I picked up Jerusalem by Yotam Ottolenghi and Sami Tamimi, two London chefs from Jerusalem. Their cuisine is full on Mediterranean: grains, vegetables, grilled meats, lemons, pomegranates. It is an explosion of bright flavors and colors, and I couldn’t wait to dive in and try a few recipes. 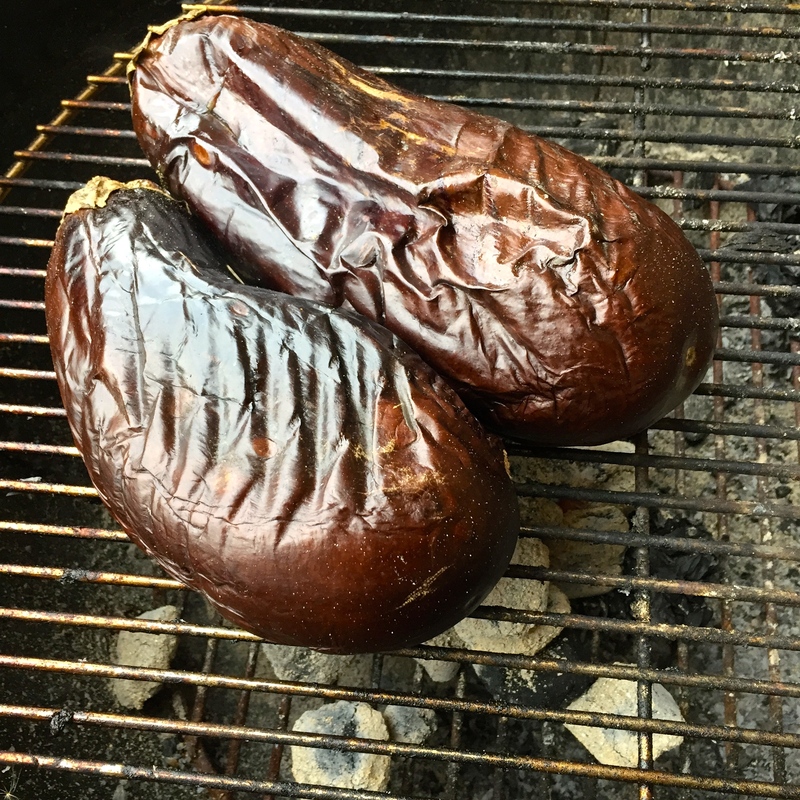 After about 20 minutes, once the eggplants have roasted and collapsed down about half their original thickness, pull them off the heat and put on a heat-safe plate. 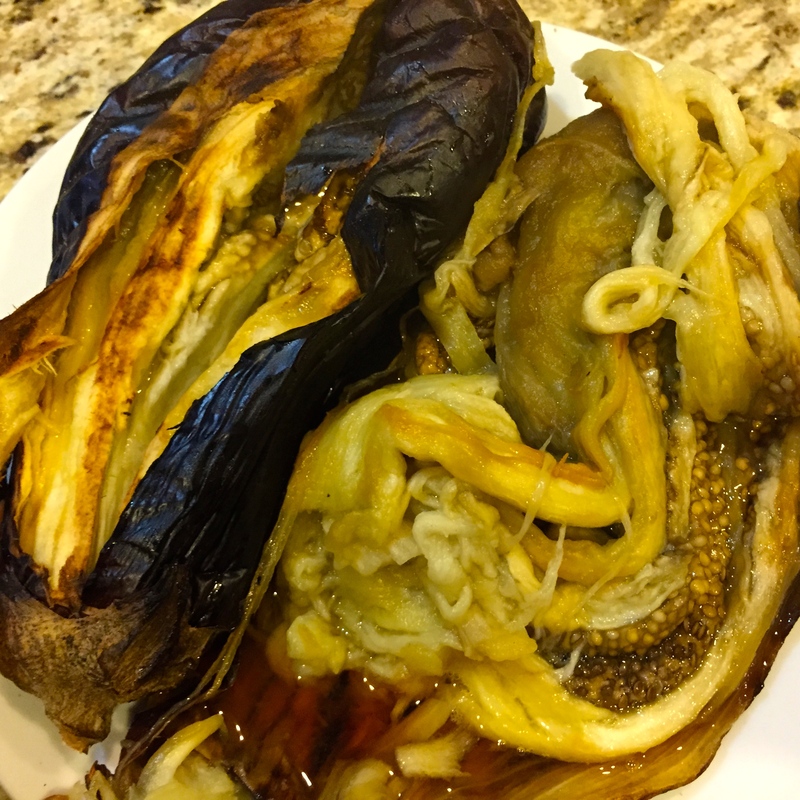 Let them rest for about 10 minutes, then cut a slice down the center of the eggplant from end to end. Pull out the insides in long strips and place them in a colander to drain (put the colander over a plate or bowl to catch the liquid that comes out). You do want to keep the seeds in this dish—like tomatoes, the seeds and the gel that surrounds them provides loads of flavor. Let the eggplant drain in the colander for one hour. You can discard the liquid that drips out, but you should taste it. Really sweet, right? 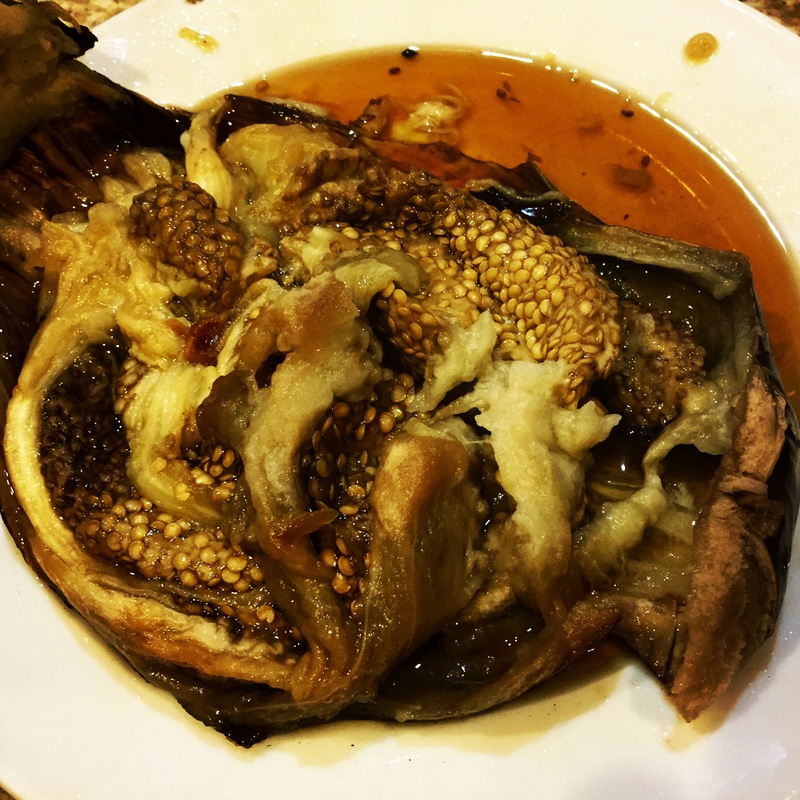 I think it is very interesting how simply charring an eggplant can make a bitter fruit so sweet. That liquid would be great frozen in a small zip top bag and added to your next vegetable soup. Condensed yummy veggie flavor! 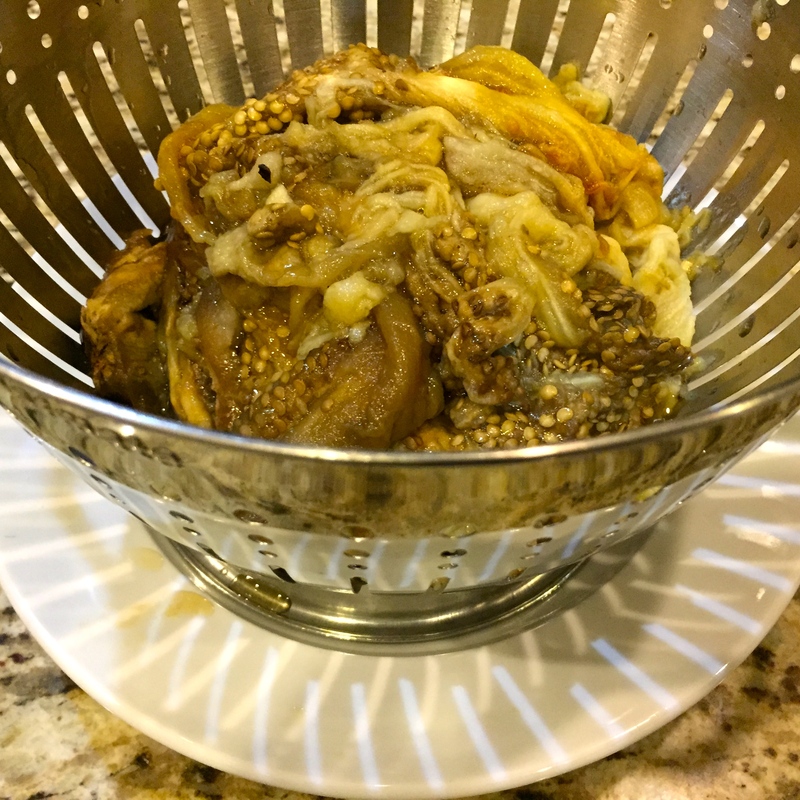 Once the hour has passed, take the pulp out of the colander and place it in a bowl large enough to hold the eggplant and the remaining ingredients. Add in two cloves of pressed garlic (if you only have jarred chopped garlic, press two cloves worth (about the size of three dimes) on your cutting board with a butter knife and scrape it into the bowl). Then add the zest of a whole lemon (but reserve about a teaspoon or two for the plates in the end). Cut the lemon and add all of its juice. Watch out for those seeds! Add in 5 tablespoons of good olive oil, ½ teaspoon of salt (to start), and ½ teaspoon of freshly ground black pepper (to start). I found that it took more salt and pepper to even out the creaminess, tartness and brightness of this, but do that later on. Stir these ingredients together and let it sit for at least another hour to meld. 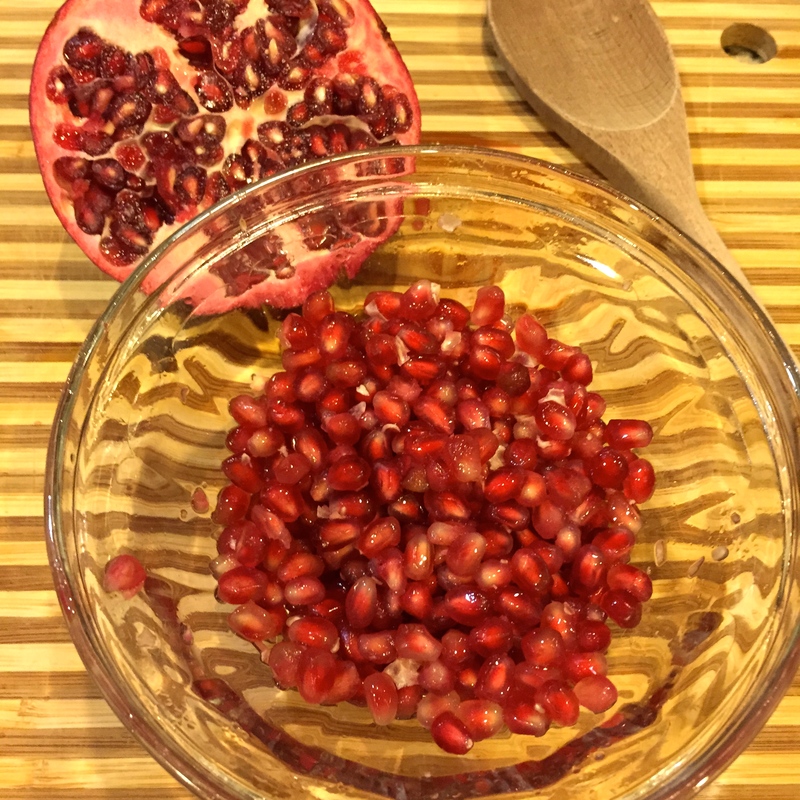 While you are waiting, cut a pomegranate in half, and place it over a bowl. Whack it all over with the back of a wooden spoon to drop its seeds into the bowl. You can pull back the white membrane and pop out any seeds that remain stuck. Eat the other half of the pomegranate while you wait. They are really terrific, and so very good for you! 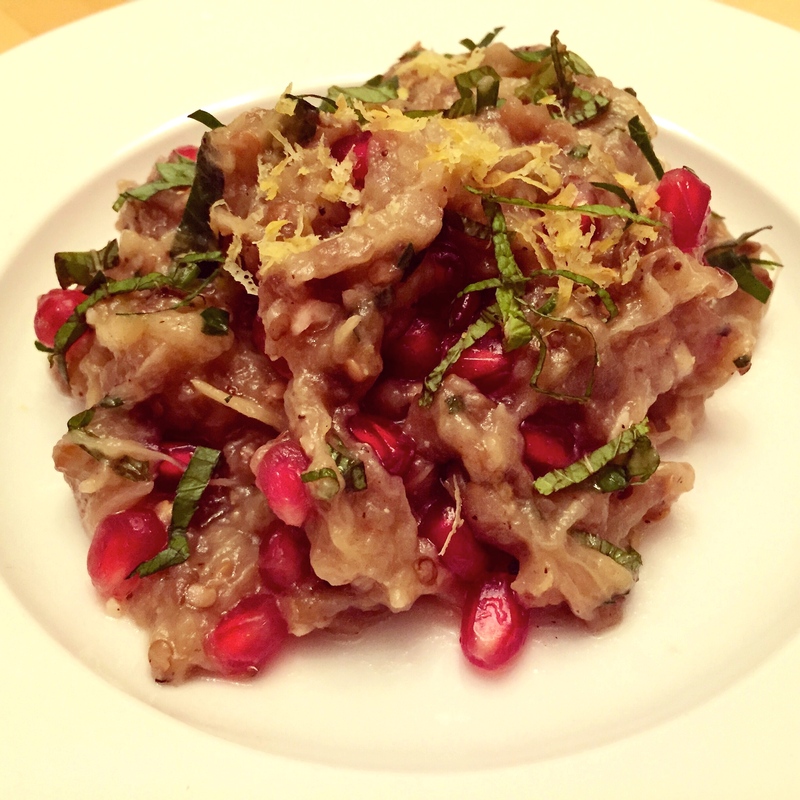 When you are done popping out the pomegranate seeds, it’s time to chop herbs. 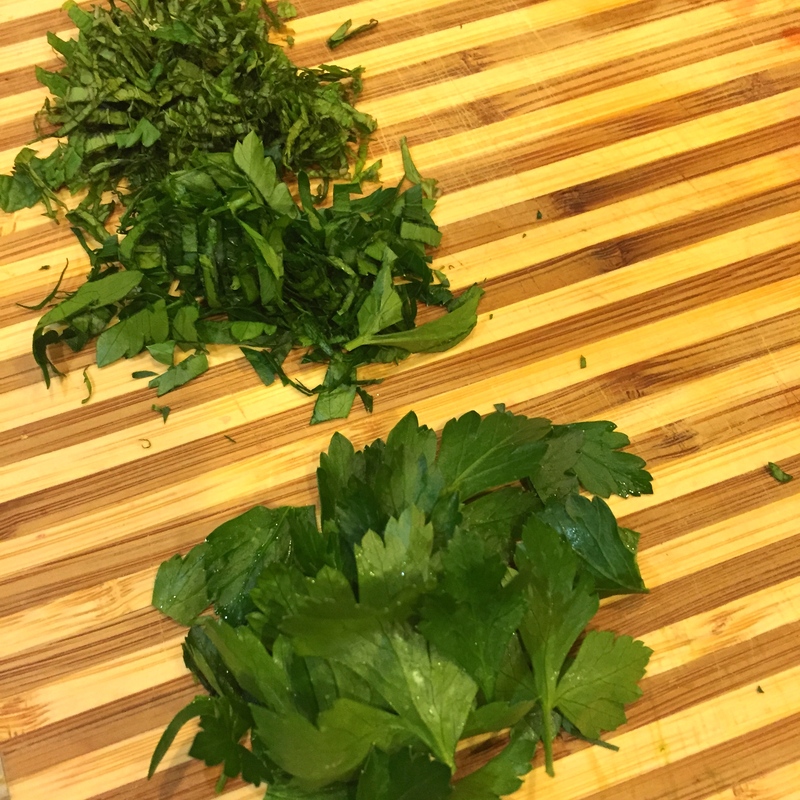 You will want to end up with 2 tablespoons of chopped flat leaf parsley (don’t use the curly stuff—the flat kind may be called Italian parsley in your market), and 2 tablespoons of mint. Take a handful of each, about as much as in the picture below, and roll it up into a tube. Then cut that tube down from the end in thin slices (just like you would cut refrigerator cookies). The French call that chiffonade, and it gives you nice thin ribbons of mint and parsley. It looks pretty, and because you have sliced it thin, you create a lot of surface area, which means more mint and parsley flavor in the dish! 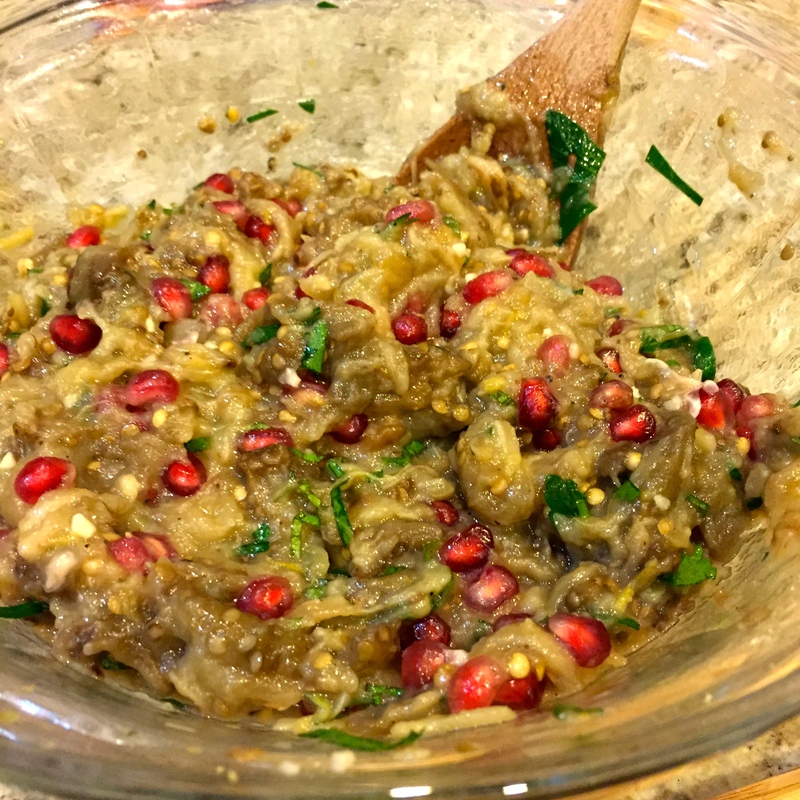 At serving, sprinkle a bit of the reserved lemon zest, mint, parsley, and pomegranate over the top. Enjoy with toasted crostini, or just in a bowl by itself. This is roasted and creamy, with bright lemon and tart pomegranate and fresh parley and mint. It is a wonderful spread for an appetizer over toasted crostini, or a great light entrée all by itself. Let the eggplant drain in the colander for one hour. 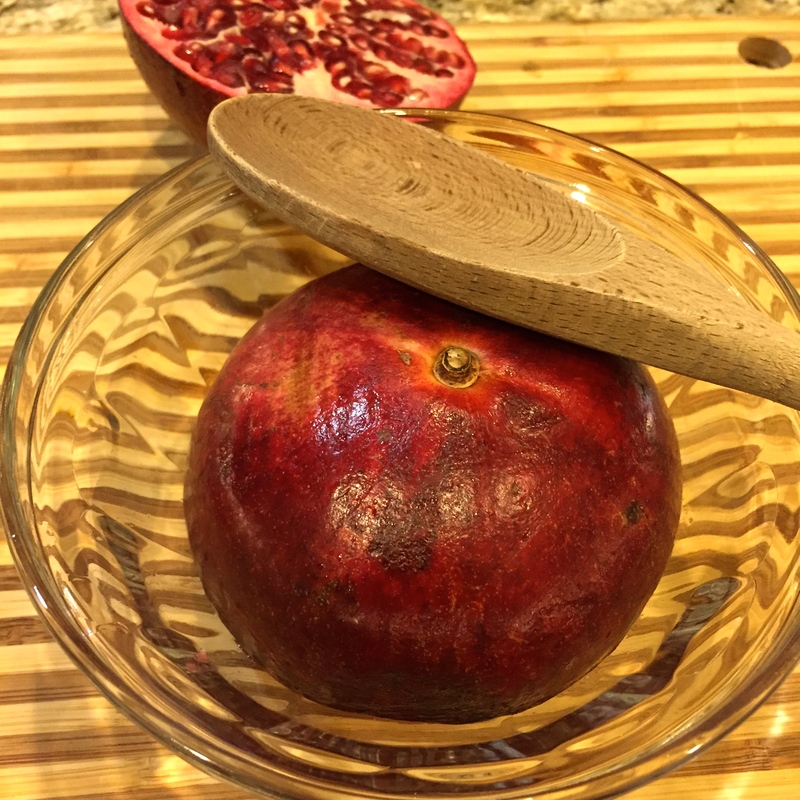 While you are waiting, cut a pomegranate in half, and place it over a bowl. Whack it all over with the back of a wooden spoon to drop its seeds into the bowl. You can pull back the white membrane and pop out any seeds that remain stuck.